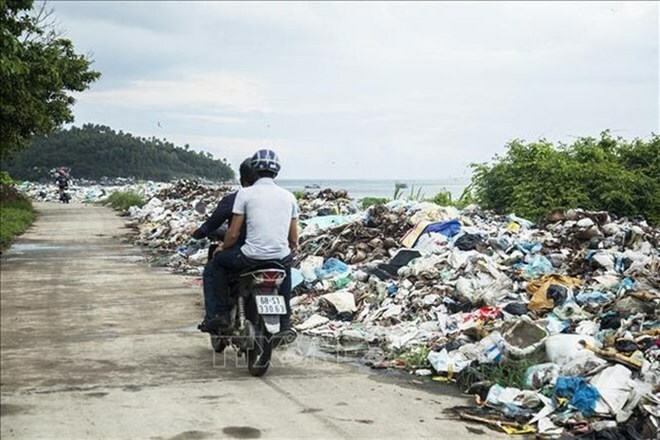 Hanoi (VNS/VNA) - Overlapping and ineffective coordination between ministries and agencies has been blamed for poor solid waste management in Vietnam’s rural areas. More than 60 million people, accounting for about 73 percent of Vietnam’s population, are living in rural areas. According to the Ministry of Natural Resources and Environment, more than 13 million tonnes of waste and about 7,500 tonnes of pesticide containers are discarded in the country’s rural areas each year. More than 80 percent of waste and almost all of the containers used for pesticides are not collected for proper treatment. Instead, they are discharged directly into the environment, resulting in serious environmental problems in rural areas. A study led by Dr Tran Ngoc Ngoan, director of the Institute of Human Geography under the Vietnam Academy of Social Sciences, shows that the emergence of residential areas and industrial zones in rural areas have reduced the area available for cultivation, leading to intensive farming and increased use of chemical pesticide and fertilisers. The overuse of pesticides and fertilisers has a negative impact on the surrounding water and soil, as crops can only absorb about 40-50 percent of the fertilisers used. Overuse of these products can increase production but this also increases post-harvest waste like straw, husks and bran, most of which is burnt outdoors, threatening human heath and reducing air quality. If fertiliser and pesticide containers are not collected and treated properly, the remaining chemicals can have an impact on surface water like ponds, lakes or rivers, underground water and the soil. The study also pointed out that the country’s 314.7 million poultry and 37 million cattle discharge about 84.5 million tonnes of waste per year. About half of the livestock waste is treated while the other half is discharged into the environment in its raw form. Ngoan said waste collection and treatment in rural areas was limited. Families in rural areas are used to throwing their waste into their gardens, or else joining with other families to pay someone to collect rubbish and deposit it in a public place, such as a roadside or along a canal. Under a national programme to develop new rural areas, about 40 percent of communes established a waste collection team that transfers the rubbish to a waste treatment firm. However, rural families still have to pay the waste collectors by themselves. In urban areas, environmental service firms receive funding from the State budget. Vietnam has developed a legal framework and improved policies to tackle rural waste. However, even the Government’s management bodies are still confused over their roles and responsibilities in handling the issues. The Ministries of Construction, Industry and Trade, Health, Agriculture and Rural Development and Natural Resources and Environment, and their branches in localities are responsible for managing solid waste. The Ministry of Natural Resources and Environment is in charge of every environmental issue. The Ministry of Construction is in charge of solid waste issues, but the solid waste that is generated by agricultural activities is overseen by the Ministry of Agriculture and Rural Development. Hazardous solid waste, including any generated through agricultural activities or in trade villages, is overseen by the environment ministry. The agriculture ministry manages the use, collection and storage of chemical pesticides but the environment ministry handles violations related to pesticides because they are classified as hazardous waste.